Hi gang. The publisher sent me a copy of this book. It's a beautiful large glossy paperback (7.5 x 0.8 x 9 inches) full of color photos. Over 300 pages. This publication is loaded with info on gardening and small farming. I have really enjoyed it and will use it often. In fact, I'm going to start my own seeds for the first time next year....using these tips! Shaye Elliott is the founder of the blog, The Elliott Homestead. She is a beekeeper, avid gardener, and spends much of her summer preserving a variety of foods for the winter larder. 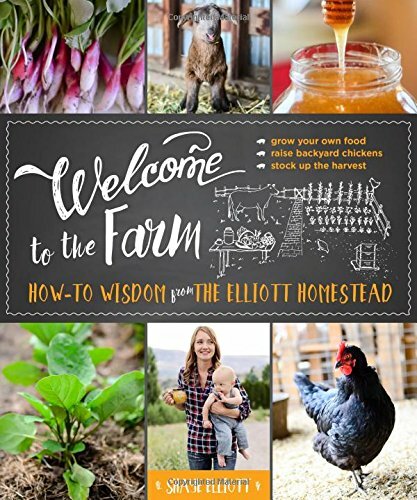 The Elliott Homestead currently reaches over 100,000 unique visitors each month, averaging around 300,000 page views per month. Shaye lives with her family in the Pacific Northwest.